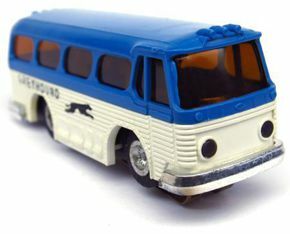 Strange though it may seem, Faller's Greyhound bus could be regarded as a cartoon caricature of a 1954 GMC PD4104. It vaguely captures some of the stylistic details, if wildly proportioned: the slanted window pillars, the riveted flat-topped wheel wells, and the blue/white color scheme. 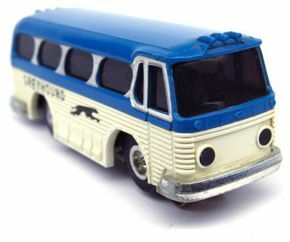 In a way it also presaged the current craze in Japan of "shorty" versions of mass transit vehicles. The shell is two parts, with a blue top glued to a white bottom. 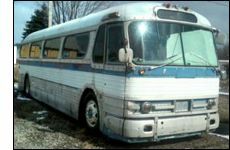 Chrome-plated bumpers are applied separately, and headlight inserts are made of the same plastic as the windows. The white plastic may yellow slightly with age, and the chrome may flake off and/or corrode a little. 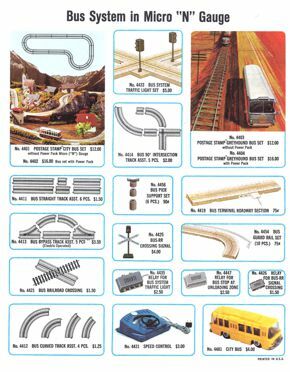 There are three subtly different versions; bus sets may contain any one of them. 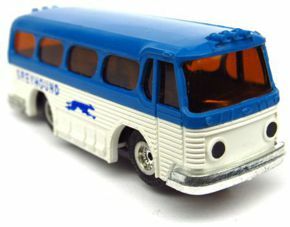 Version 1: Windows are tinted dark blue-grey, window frames are painted bright sliver, and the Greyhound name and logo are printed on the sides in black (above left). Version 2: Windows are tinted pinkish-amber, window frames have no silver, and the name and logo are printed in black (above right). Version 3: Same as Version 2, but with the name and logo printed in blue (below). 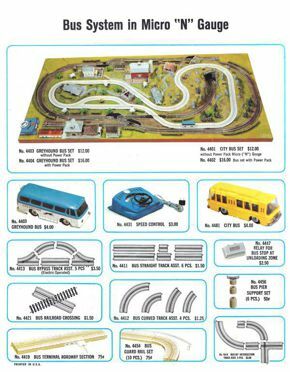 Refer to the city bus page for packaging, mechanism and other information; additional details are provided in the bus set instruction booklet. Has anyone noticed that the tires are branded "Continental"?